What Day Of The Week Is August 18? 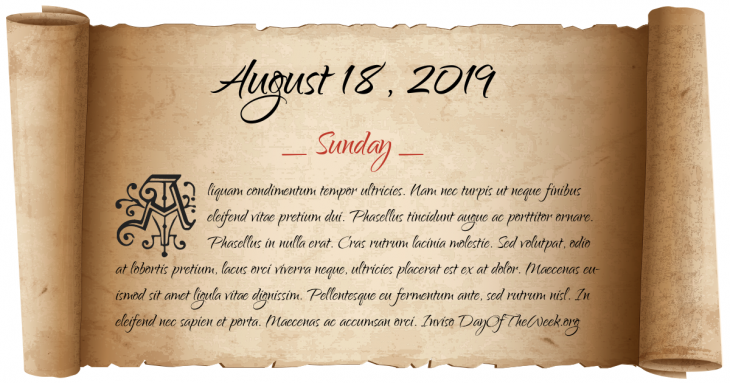 August 18, 2019 is the 230th day of the year 2019 in the Gregorian calendar. There are 135 days remaining until the end of the year. The day of the week is Sunday. Marriage in Paris of the future Huguenot King Henry IV of Navarre to Marguerite de Valois, in a supposed attempt to reconcile Protestants and Catholics. American Civil War: Battle of Globe Tavern – Union forces try to cut a vital Confederate supply-line into Petersburg, Virginia, by attacking the Wilmington and Weldon Railroad. The Thousand Islands Bridge, connecting New York State, United States with Ontario, Canada over the St. Lawrence River, is dedicated by U.S. President Franklin D. Roosevelt. The Australian cricket team completed a 4–0 Ashes series win over England during their undefeated Invincibles tour. Vietnam War: the Battle of Long Tan ensues after a patrol from the 6th Battalion, Royal Australian Regiment clashes with a Viet Cong force in Phuoc Tuy Province. Steve Biko is arrested at a police roadblock under the Terrorism Act No 83 of 1967 in King William’s Town, South Africa. He would later die of the injuries sustained during this arrest bringing attention to South Africa’s apartheid policies. The West Memphis Three are released from prison after 18 years in imprisonment. Who were born on August 18?